​To be properly kitted out with tentage, uniform, accoutrements and musket the total cost is between $2,000 and $3,000, with the largest expense being the Brown Bess reproduction musket. Do not be overwhelmed by the large cost. We have loaner muskets and some loaner kit to help new recruits with the initial expense and to ease into the hobby. There is also a small annual fee for all members that covers our administration costs and insurance for our season. ​What is the time commitment going to be? How do I get my uniform and kit? ​We have developed a network of suppliers and we will help putting you in touch with these businesses balancing affordable cost with historical accuracy. I'm not located near Detroit or Hamilton, can I still join? ​Yes! While it is ideal to be able to easily drive to join our companies for events, drills and meetings, we do have membership as far away as Ottawa and Winnipeg. How hard is it to learn to be a British soldier? Should I have a military background? Do I need to be a historian? A love of history helps but an in depth knowledge of the history is not required. Our membership comes from a variety of backgrounds, everything from University Professors, Salesmen, Engineers, Soldiers to Truck Drivers. Some of our membership stick to the life in the camp and the tacticals while others get quite involved interacting with the public and interpreting the history of the period and the conflict. This is up to you and your level of comfort. ​Do I get to wear a red coat and fire a gun? Yes! The 41st Regiment of Foot MLHG is a re-created unit of British Army regulars. We portray a line company; that is we are in the middle of the heavy fighting. With our careful training and qualification, you will be taught to handle a flintlock musket safely (never call it a gun or rifle!) and fire with black powder cartridges. Canadian law says that on antique (or antique reproduction) flint-lock firearms, no standard FAC (Firearms Acquisition Certificate... which is being phased out in favour of the Possession and Acquisition License) is required. Training you on the use and safety of your flintlock (Brown Bess) will be done by the 41st Regiment at our drills and, if possible, at some events. Is the 41st Regiment a historically "real" group or is it just one for reenacting? Definitely YES! The original 41st Regiment of Foot played a critical role in the history and defence of Canada. The 41st made up the majority of the British regulars who were in Canada at the outbreak of hostilities in 1812. The 41st participated in famous battles such as Detroit, Queenston Heights, Lundy’s Lane and Fort Erie. The 41st Regiment won more battle honours in the war (Detroit, Queenstown, Miami and Niagara) than any other British regiment. We have a page devoted to the early history of the unit which you can view in the “history” section of our website. ​I'm not really sure if I want to join up and would like more information. What's my best way to learn more? Contact us! We can meet with you to further discuss our group and the hobby in general. We would be happy to show you a flintlock musket, the uniform and some of the kit and accoutrements. We also would be happy to invite you to join us at one of our winter drills, one of our garrison events (at Fort George, Fort Malden or Fort Erie) or at an event. There are many options to explore and we love to talk about our hobby! Visit our Contact page for more information and to get in touch. I'm a female and I'd love to join, but I want to be in the field as a soldier. Is this possible? We are sorry but as a group we strive for historical accuracy and no women served as soldiers in the British army during this time period. You are more than welcome to join us as part of a family or a couple. We do have women who act as camp followers and accompany us to events. If you wish to be a soldier, we can direct you to some groups that do accept females as soldiers. Can my family attend events? Yes! We have families that regularly attend events. Children are as a part of an encampment as the adults! It's a great "community" for families to share and enjoy. ​I do not think my family would be interested in this. can I join as an individual? ​Yes! Some of our members go to events as families or couples but many will attend as only soldiers. What happens at a weekend event? Normally we arrive at the site on Friday evening and set up our tent line. Once our camp is set up, we will change in period dress and strive to live “in period” for the remainder of the weekend. Some sites will provide meals, usually breakfast and on occasion a Saturday dinner. We are also fortunate in having several individuals that are excellent at cooking period recipes over an open fire. There are times that we will all contribute a small amount of cash to cover the groceries for our camp kitchen for a weekend. The normal flow of a weekend includes morning drill (sometimes both company and battalion), an afternoon battle, often an evening battle and then on the Sunday another afternoon battle. There is usually a lot of free time for shopping at the sutlers, socializing and relaxing! How much do we get paid for this? There is no pay. This is a hobby. Think of it as camping for a weekend at a historical site with some battles thrown in for good measure. On occasion a site may offer an allowance for travel or provide some black powder but don’t count on it! How do I obtain rank? Rank is earned through participation, above and beyond support of the unit, knowledge and leadership. ​I don't see my question on this FAQ! Where can I get the information? ​Contact us! Email or call and we will happy to answer any questions or set up a meeting. Visit our Contact page for more information. ​Private soldiers were issued their basic uniform and kit. The regimental red coat was made of heavy wool. Different regiments were distinguished by the colour of the ‘facings’ on the cuffs and the collars. A further distinguishing feature was the shape and design of the Regimental lace. In the case of the 41st Regiment, the facings at this time were red, and the lacings were in the "Jew's Harp" bastion loop design. The lace itself for all private soldiers and junior NCOs was a half-inch white tape with a black line or worm in the middle. What a private was issued dose change from year to year during the war. 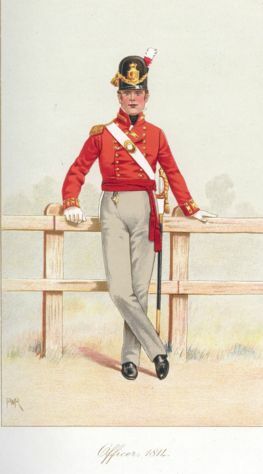 Upon the onset of the war the uniform that was issued consisted of, 1 stovepipe shako, 1 regimental tunic (red coat), 1 leather neck stock, 2 -4 white linen shirts with some exceptions, 2 white Russian hem trousers, wool socks, 1 pair of leather low-quartered boots, 1 pair of buckle shoes (with or without buckles), I pair of half gaiters, 1 white woolen barracks coat, 1 regimental bonnet de police, 1 greatcoat issued seasonally to 2 privates. When on parade a private soldier would be fully dressed along with, 1 India pattern brown bess musket, 1 regimental belt plate, 1 whitened buff leather bayonet cross belt, 1 bayonet with scabbard, 1 whitened buff leather cartouche cross belt, 1 cartouche box 1804 pattern, 1 pick and whisk. When on campaign there was also, 1 linen haversack, 1 oak canteen, 1 painted knapsack, 1 white wool blanket. On top of all the necessaries a private would also be responsible to carry all his personal effects, and up to 1 week’s worth of food rations. By 1813-14 the uniform dress orders change. The head dress has updated to the Belgic shako, and the trousers are made of grey wool along with the gaiters. The rest of the uniform will stay the same till the end of the war.